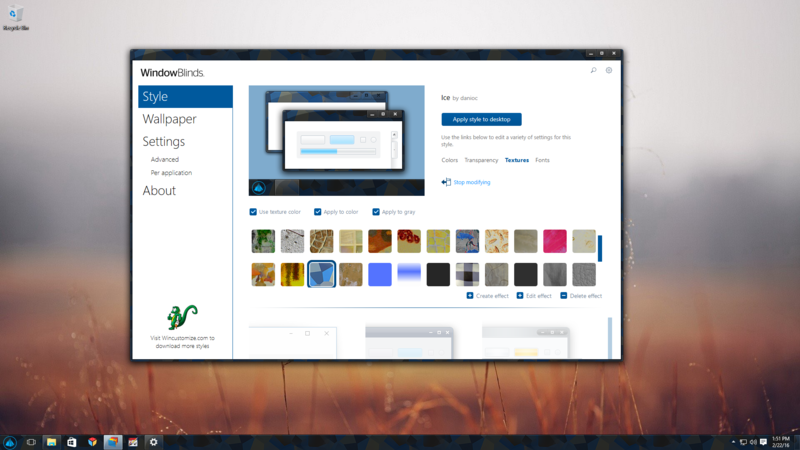 New WindowBlinds 10 Brings More Customization to your Windows 10 Experience! 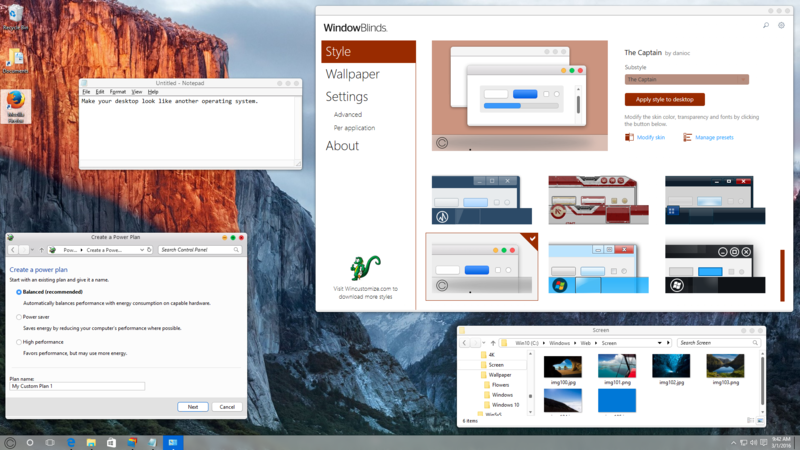 The New WindowBlinds 10 is Windows 10 compatible, has a new UI, and new skins for a broader customization experience! Make your desktop uniquely yours with WindowBlinds 10! 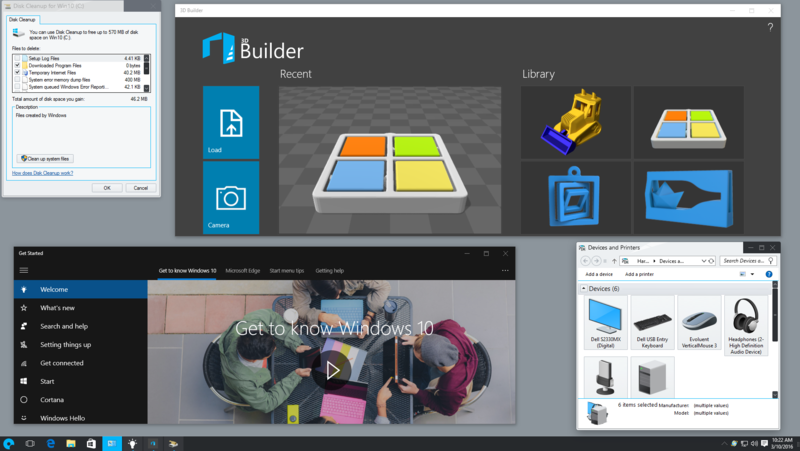 Customize the task bar, window frames and control buttons! 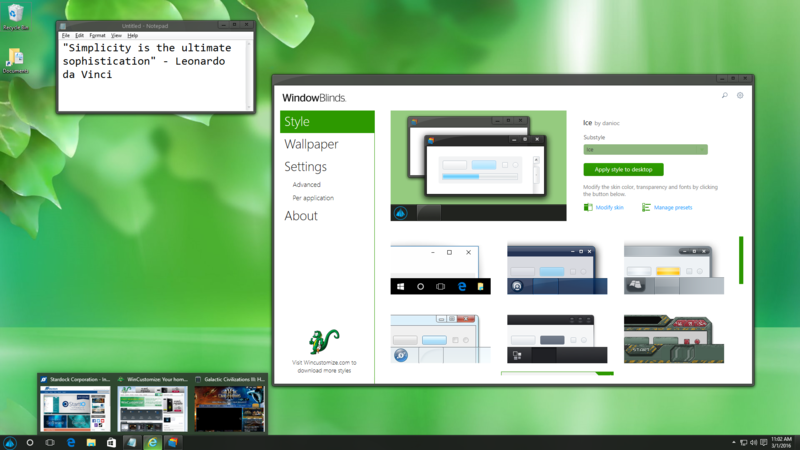 WindowBlinds enables users to customize desktop interface themes called skins to personalize the look and feel of their desktop. Get WindowBlinds 10 for just $9.99! Make your desktop look like another operating system. A simple and elegant style enhances any desktop. The first WindowBlinds style to change the min/max/close buttons on universal apps! 2006 Windows Xp Facelift by Choon Hian. Relive the good old days of Windows XP. Personalize any style with textures or your own creations. Exciting skins are available at WinCustomize. Do you own a previous version of WindowBlinds and want to upgrade to WindowBlinds 10? See if you are eligible for an upgrade discount here. 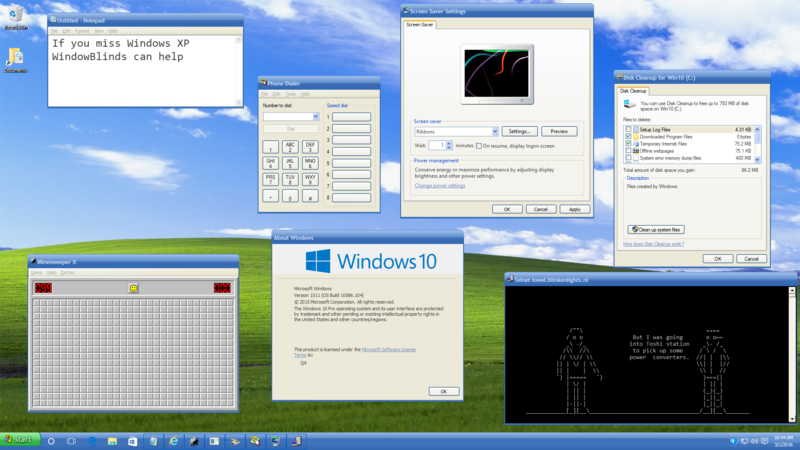 Object Desktop owners get WindowBlinds 10 for free! 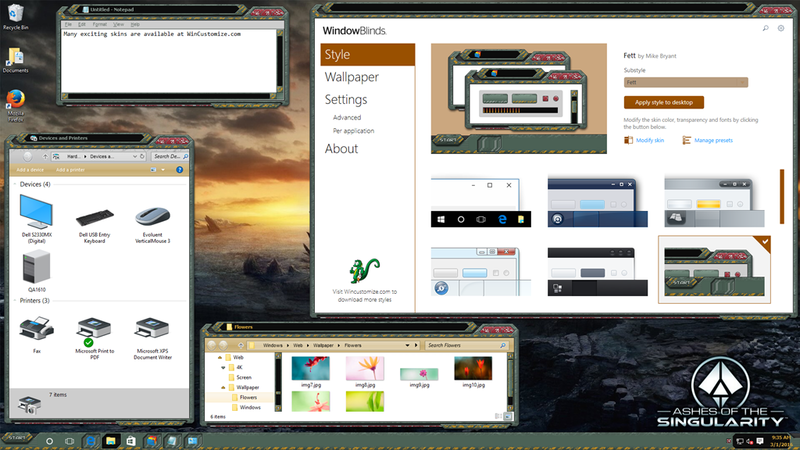 Get WindowBlinds along with other popular Stardock apps like Fences and DeskScapes by becoming an Object Desktop subscriber. Learn more here. Having not used WindowBlinds in the past I was hoping there would be a trial available. The current trial version appears to be for Windows 8(8.1). Will the current trial version get updated shortly? Just a heads up, Smart Screen Filter tried to block the download from my store account page. I had to go to other options and allow it. That's the first time I can ever remember that happening with any SD software. Also now on install, the About and tray icon say I still have 8.05 install, yet I do have the new UI. I have rebooted. I will try an uninstall, reboot and reinstall/rebootl and report back. Another edit, Add/Remove programs says I have 10.03 installed. That straightened things out, but those are more steps than I should have to take, IMHO. Great job on the new UI, I like it a lot. Just a heads up, Smart Screen Filter tried to block the download from my store account page. As with UAC (Useless Annoying Crap) , SmartScreen is turned off on my rig. I have no need of it. Very NICE update with the BETA. ... for some reason, I had to used the Stardock Alternative Activation. It's all good !!! The Captain is a very nice alternative skin of the OS X skin. nobody spotted the bug in the promo? Yes and annoyingly the skin itself does not show that issue with the release version of WB10. I have raised my 'concerns' over this. I don't have the skin Fett, Neil. Could it be because I have a personal windows 7 tweak that I did years ago installed? It's not included, it's just one I love and wanted to use for a screenshot. For personal use only. I never bothered asking for permission to upload because skinners rarely give that in my experience. I have a completly Windows 7-10 compatible version of Fett just sitting here. Going to be purchasing this tomorrow when I get my paycheck. Though when it said "Windows 10 Support Coming Soon!" on the main page I was under the assumption that the current version of WB 8 was going to get the proper support through a patch. I guess a new version had to be developed to achieve this support. Have no issues buying it since you guys gave me a nice discount offer but kind of confused still. Is it necessary to uninstall WindowBlinds 8 before installing WindowBlinds 10? My OS is currently Windows 8.1 Pro x64. Many thanks in advance. must have been around 2008 when that appeared in the Microsoft codelabs. (btw: this system is a upgrade install from win8.1, where WB8 was installed on. The installation of WB10 went absolutely perfect ! Never stuck anywhere, clean and stable and fast swapping between the skins, WOWWW !!! WAY TO GO ! thanks for being the first skinners jumping on again ! its a great day !! Greetings to all !! Yes as WB10 is very different from WB8. Uninstall WB8, run CCleaner if you have it, reboot then install WB10 and reboot again. New version installed perfectly here. Great job!! The new skins are awesome and WB works flawlessly here. Thanks ! I encountered a bug where explorer.exe started using up 100% of 1 core 10-12 hours after I had switched to a skin (Scarlet), and a bunch of buttons/pixels in the top left corner (roughly above the left edge of the address bar is in explorer) kept flickering in/out of existence. Had to switch to a different skin after killing/restarting explorer.exe (the issue persisted) to 'fix'. Atm I don't have any further clues/ideas about reproducability, will update if it recurs. Additional issue: Firefox has by now crashed twice while trying to show a download window (to pick to open/save a file) since installing wb10 (on w10 x64 b1511), whereas it never did so before. How to close a Fence?